The ideal size for an apartment, bedroom, or smaller living room, this 40” HDTV makes movies, live TV, and video games look sharp and vibrant thanks to its 1080p resolution and Full-Array LED backing. Stream a movie rather than walking to a Redbox, or binge on your favorite TV shows online. This Smart TV’s built-in WiFi and preloaded apps expand your entertainment options without the clutter of cables and external streaming devices. Apps include Netflix, Hulu Plus, and YouTube. The 120Hz refresh rate delivers a picture that’s smooth and easy to follow by completely rebuilding it 120 times per second. This virtually eliminates blur, preserving a high level of detail even in fast-action entertainment such as action movies and live sports. Product weight (without stand): 15.87lb. Launching in 2002, when rival companies had been selling TVs for decades, Vizio may be a relative newcomer to the TV market, but it hit the ground running. By 2007, it sold the most LCD TVs in America. Its runaway success is thanks in large part to its bread-and-butter HDTV, the LED-backlit 1080p set that can be found in most living rooms. Yet the company also takes chances on the latest technologies. In 2015, for instance, it launched what is arguably one of the most high-end sets ever produced—the $130,000 Reference Series, a 120” 4K set with support for more than one billion colors and integrated 5.1-channel surround sound. While the hefty price tag will deter most TV shoppers, Vizio will inevitably find a way to pack the cutting-edge technologies into a more consumer-friendly set—the approach to TV-making that brought it success in the first place. Interested in buying a TV mount as well? 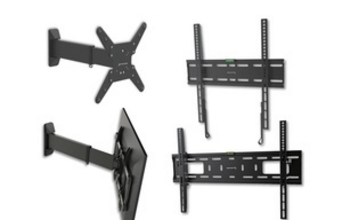 Make note of the VESA pattern for the TV you’re buying, and shop TV mounts here.